NEW YORK (CNNMoney.com) -- The fate of the government's $700 billion financial bailout plan was thrown into doubt Monday as the House rejected the controversial measure. President Bush, who earlier in the day said he was confident the bill would pass, said he was "very disappointed" by the House vote. Treasury Secretary Henry Paulson, speaking at the White House, said he will continue to "use all the tools available to protect" the economy. Republican leaders, who had pushed their reluctant members to vote for the bill, pointed the finger for the failure at a speech given Monday by Speaker Nancy Pelosi, D-Calif.
Pelosi, speaking on the House floor, had blamed the nation's economic problems on "failed Bush economic policies." House minority leader John Boehner, R-Ohio, said after the vote that passage would have been possible if it had not been for Pelosi's "partisan speech." Rep. Barney Frank, D-Mass., one of the main congressional negotiators, dismissed the GOP claim that Pelosi's speech was responsible for Republicans voting against the bill. "Because somebody hurt their feelings, they decided to hurt the country," Frank said. "That's not plausible." The four-hour debate that preceded Monday's vote included impassioned pleas for and against the measure from Democrats and Republicans alike. Party leaders told members that the only way to protect the economy from a spreading credit crunch was to vote for the difficult-to-swallow measure. "Our time has run out," said Rep. Spencer Bachus, R-Ala., the ranking Republican on the House Financial Services Committee. "We're going make a decision. There are no other choices, no other alternatives." Added Frank: "Today is the decision day. If we defeat this bill today, it will be a very bad day for the financial sector of the American economy." "If I didn't think we were on the brink of an economic disaster, it would be the easiest thing to say no to this," Boehner said. But he said lawmakers needed to do what was in the best interest of the country. One lawmaker who voted against the bill, Rep. John Culberson, R-Texas, said the measure would leave a huge burden on taxpayers. "This legislation is giving us a choice between bankrupting our children and bankrupting a few of these big financial institutions on Wall Street that made bad decisions," he said. Culberson voted against the bill. Other conservative Republicans who voted "no" argued the bill would be a blow against economic freedom. Thaddeus McCotter, R-Mich., said the bill posed a choice between the loss of prosperity in the short term or economic freedom in the long term. He said once the federal government enters the financial marketplace, it will not leave. "The choice is stark," he said. "Like the Iraq war and Patriot Act, this bill is fueled by fear and haste," said Lloyd Doggett, D-Texas. The core of the bill is based on Paulson's request for the authority to purchase troubled assets from financial institutions, so banks can resume lending and the credit markets, now virtually frozen, can begin to operate more normally. Democrats and Republicans - concerned about the potential cost - added several conditions and restrictions to protect taxpayers on the downside and give them a chance at some of the potential upside if the companies benefit from the plan. The turmoil in Washington comes amid great upheaval in the nation's financial system. In turn, the market for trillion of dollars worth of those securities held by major firms evaporated, sending them down to fire-sale prices and raising the risk of widespread failures among the nation's major financial firms. 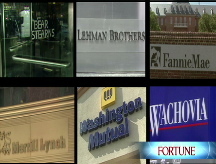 On Monday, the Federal Deposit Insurance Corp., which insures deposits at failed banks, arranged for the sale of the banking assets of Wachovia (WB, Fortune 500), the nation's No. 4 bank holding company, to Citigroup (C, Fortune 500) for $2.2 billion in stock. In addition, the Fed bailed out insurance giant American International Group (AIG, Fortune 500), loaning it $85 billion in return for a nearly 80% stake. Washington Mutual (WM, Fortune 500), the nation's largest savings and loan, became the largest bank failure in history. Sen. Judd Gregg, R-N.H., a lead negotiator in the bailout bill negotiations said, "If we don't act promptly and effectively, then many people are going to lose their jobs."